Mat Cauthon as the Prince of the Ravens, consort to Tuon, Empress of Seanchan. As Ruler of Battles, his throne is the Dragon cannon created with Aludra. His flags represent the Band of the Red Hand and Seanchan nation. Behind him is the Horn of Valere, and hanging over his head is the ruby hilted dagger from Shadar Logoth. His role as the Gambler is signified by the Devil's eyes in the border, as are the Snakes and Foxes from Ghenji. Rand Al'Thor as the Lord Dragon. Rand is depicted striding into Merrilor to parlay with the nations for the Dragon's Peace. He unfurls the tent fabric, Dragon Banner, & Aes Sedai banner as he reaches the field. In the border are Callandor, the Dragon's Scepter, & the Choedan Kal statue keys. The border itself represents the rising sun of Cairhein. The Bees & Crown of Swords represent Illian. This painting represents Moiraine in the Tower of Ghenjei held captive by the Eelfinn, who feed on the Power flowing through her and her emotions from the its loss. The circle represents the tower, and the eight pointed star represents the Chamber of Bonds where Moiraine is floats within a mist coming from the floor of the room. The star is a Celtic knot to represent the convoluted halls of the Eelfinn. Based on various visions from the series, this image represents Lan, Nynaeve, and the future heir of Malkier. The Malkieri crane is represented in the baby's cradle, Lan's stained glass sigil, and his armor. Nynaeve's sigil is imagined as the thorns and bud from her Accepted testing. Hero of the Horn, Archer of Tel'aran'rhiod. Nynaeve was revered because of her discoveries in Healing. This painting depicts Nynaeve in ecstasy during the use of the Choedan Kal and it's torrent of Power, and draws allusions to artwork depicting the Ecstacy of St. Theresa in our world. The character Nynaeve is the property of Robert Jordan. "Poster" for Luca's Traving Menagerie created for the 2015 Wheel of Time™ Calendar and featuring Birgitte, Nynaeve, Elayne and Juilin. Alter ego of the Forsaken Lanfear, the most beautiful woman in the world. As her sigil is a crescent moon and stars, I've conflated her with the Greek moon goddess, which I've no doubt would please her. This character is the property of Robert Jordan. Most depraved of the female Forsaken. Dark, beautiful, a one time healer who has evolved into the Great Mistress of pain. If Selene is the moon, the Forsaken Graendal is the sun… warm, also beautiful, yet also evil. She uses Compulsion to cause her subjects to adore her, and prefers to make pets of the most beautiful youth of the nobility. Here she is pictured with two of her pets. This character is the property of Robert Jordan. A scene from Robert Jordan's Wheel of Time featuring Matrim Cauthon in a tricky situation with Tylin Mitsobar, Queen of Altara. Characters are the property of Robert Jordan. 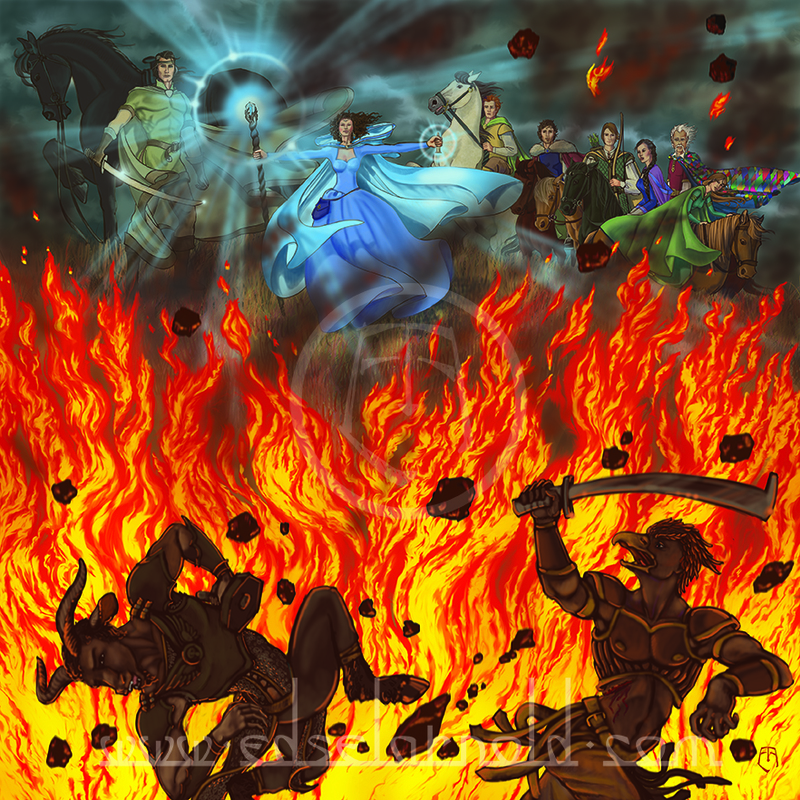 Scene featuring Egwene Al'Vere and Verin Mathwin of the Brown Ajah created for the 2015 Wheel of Time™ Calendar. Moiraine protects the Emond's Field youths from a trolloc attack by creating a wall of fire. Created for the 2015 Wheel of Time™ Calendar.